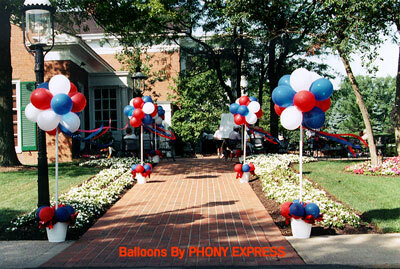 These "wind resistant" balloon topiaries decorate a pathway leading guests to a Fourth Of July barbecue. 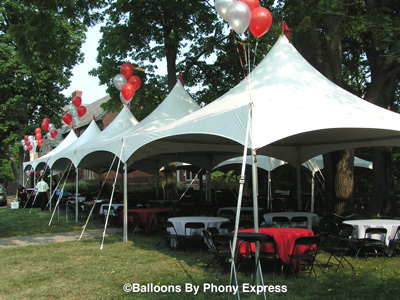 Topiaries can lead your guests to key areas, decorate outdoor buffets, and add color to your outdoor event. 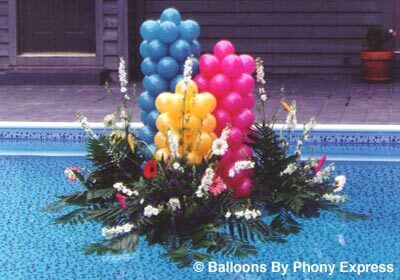 A combination of tropical colored balloons and florals creates a stunning pool float. 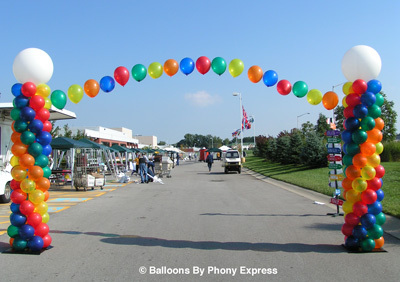 Phony Express can work with a special events florist to coordinate decorations for your event. 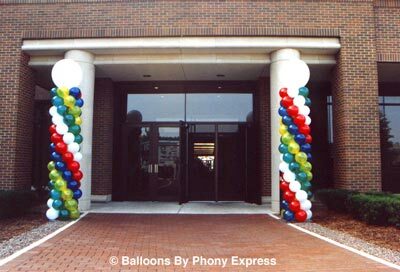 Balloon columns, stabilized with our heavy outdoor baseplates, provide a colorful way to welcome your guests. 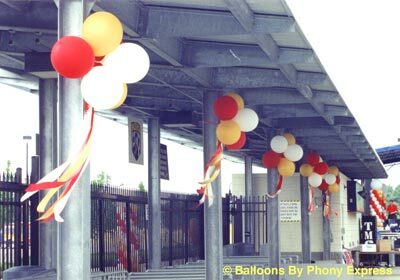 "Windsock" clusters with wide flowing ribbons will add action as well as color to your outdoor venue, as shown above at Crew Stadium and on the tent in the picture below. 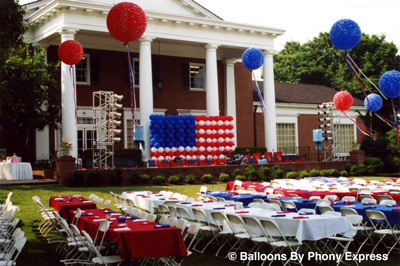 Floating helium columns give a big impact to outdoor events. 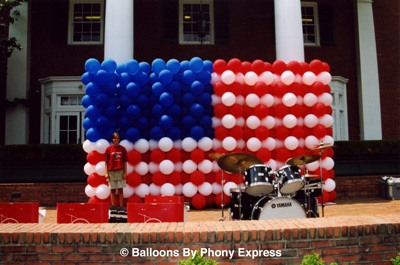 A large "Balloon Flag" creates a focal point. 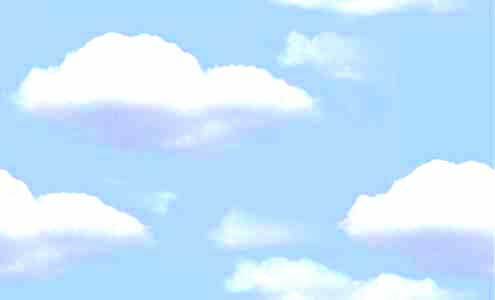 This flag measured 10.5 feet high by 17 feet wide. 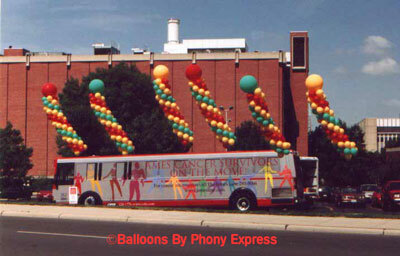 Giant 3-foot star-imprinted balloons with trailing ribbons make a dramatic centerpiece, flowing in the wind above the tables. 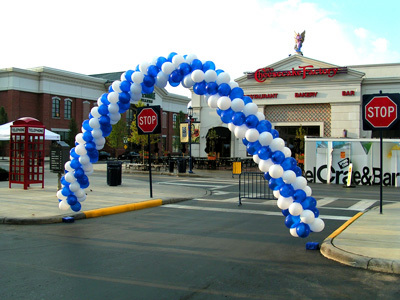 A spiral arch (above) creates an elegant outdoor start for a race, but is susceptible to rain and wind. 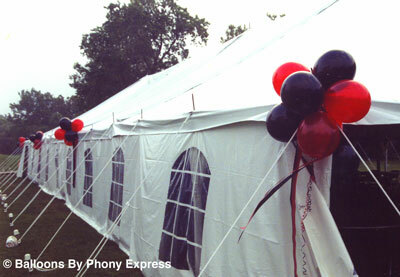 The two columns with connecting single arch (below) form a wind-resistant alternative.